« BOUTIQUE Westside Vancouver SOTA South Granville Condos for Sale at Birch & 14th! From $229,900! RiverSky New Westminster condos start from an incredible presales price point in the low $200’s, making them the most affordable concrete high-rise view residences in the region. Featuring one, two and three bedroom floor plans, the New Westminster RiverSky by Bosa condos will be located on the Esplanade boardwalk, next to the shops and restaurants of River Market, just steps away from the SkyTrain station. This 33 storey landmark New Westminster waterfront condo tower will forever change the skyline of this downtown area, and will present suites for sale starting from the 6th floor. Many of the homes will have panoramic and unobstructed views! The site location for RiverSky by Bosa is at 1000 Quayside Drive New Westminster BC. According to their marketing: Waterfront living is everyone’s dream, and New Westminster is the urban community of choice for so many home buyers. Where else can you get the amazing livability of an established waterfront community with access to the SkyTrain – all at an affordable price! Situated next door to New Westminster River Market’s many shops and restaurants, RiverSky by Bosa is also just 15 minutes from downtown Vancouver via the SkyTrain that also connects to YVR/Richmond and the rest of the Lower Mainland. Many of the New Westminster RiverSky condos will also have spectacular and dramatic views of the water, city and mountains! One bedroom presale New Westminster RiverSky condos are priced from just $229,900 while 2 bedroom spacious floor plans are priced from just $339,900! Again, RiverSky New West condos are brought to you by one of our favourite local master builders, Bosa Properties. You can get more information online at www.bosaproperties.com or the project specific page at http://bosaproperties.com/riversky/index.php. Presales are expected to start in early Spring 2015 (in February). For an advanced look at this landmark project, please view the RiverSky condo video below… we promise that you will get as excited as we are for this new development! Discover the next great waterfront community—complete with Bosa’s signature design and quality craftsmanship—here at New Westminster’s river’s edge. Walkable, liveable and central, it offers everything you’re looking for. Bosa Developers has engineered and designed some of the most efficienct and functional floor plans in the world. Homes as big as your life are now available at RiverSky New Westminster where you fill find BosaSpace floorplans that change form and function to meet the shifting rhythms of your daily life. Adapting to dinner parties, game nights and even overnight guests, the BosaSpace floorplans at RiverSky New Westminster feature innovative design that invites you to live larger than you would have believed, all at an affordable price. StoreMore by Bosa is an option for one and two bedroom homes at RiverSky New Westminster which puts extra shelving inside your pantry: racks for storing wine and stemware, flex shelves and a pull down ironing board. 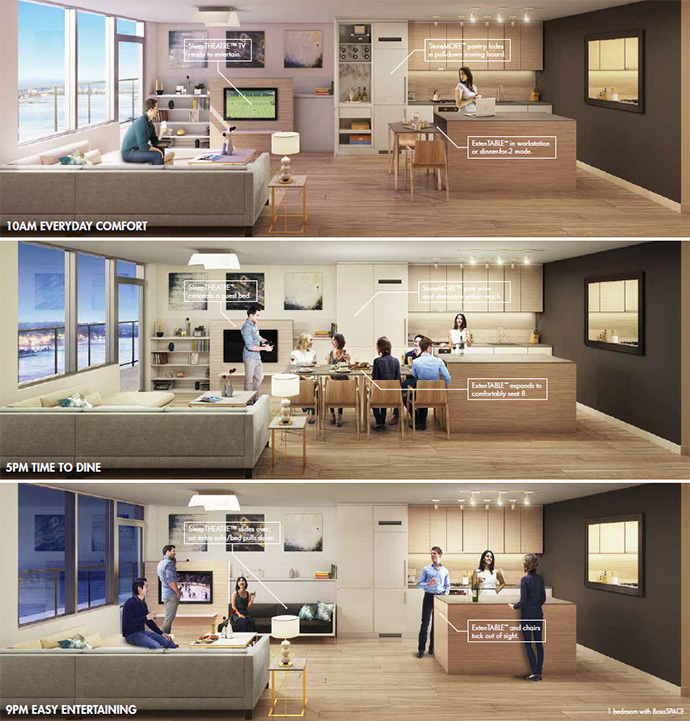 As seen in this fabulous rendering, you can have three or more different layout setups for your New Westminster RiverSky condo with StoreMore and BosaSpace engineering. At 10am in the morning, you can have a spacious living room plus plenty of kitchen space for breakfast. ExtenTABLE is a table for 2 or a desk. The spare bed is hidden inside SleepTHEATRE and StoreMORE is where your ironing board lives. At 5pm after work, ExtenTABLE transforms from a table for 2 to table for 8 in less than five minutes! SleepTHEATRE is still the focal point of a comfy entertainment lounge for the evening and StoreMORE hides a wine rack and glassware within easy reach for dinner time. The BosaSpace at RiverSky New Westminster also functions for 9pm entertaining. Get the party started by tucking away ExtenTABLE inside the island and stack and store the chairs to double your living room size! Slide the SleepTHEATRE TV away to reveal a sofa for 3 or a guest bed for a guest! These are the amazing pioneering features by Bosa Developers and they are available at New Westminster RiverSky Condos right now! 1 Bedroom floor plans with parking start from just $229,900. 1 Bedroom layouts without parking start from $209,900. 2 bedrooms (standard 1 bathroom) start from $339,900 while 2 bedrooms with 2 large bathrooms start from $445,900. 3 bedroom floorplans at RiverSky by Bosa start from $489,900 during the presales event. Affordable waterfront living will be available to presales home buyers very soon! Introducing Bosa’s River Sky New West condo project located in the heart of the city along the Esplanade. The condominium towers will be within walking distance to the SkyTrain Station, many community amenities/services, commuter routes as well as the River Market and waterfront districts, making this property one of the most sought after pre-construction developments in 2015! Located at the edge of the Fraser River, the New West River Sky condo project will feature a fresh perspective in waterfront living within reach for most presale homebuyers. The RiverSky condos by Bosa will range from just $229,900 for 1 bedrooms and the ultra spacious and highly functional 2 bedrooms will start from the low $300’s. The first tower at RiverSky New West condos will be thirty three stories in height and will boast 1, 2 and 3 bedroom floor plans which will be released at the grand opening. At these price points, the River Sky condos will be more affordable than any other waterfront condominium in Vancouver, Coal Harbour, Richmond or anywhere else in the Lower Mainland. Some of the planned amenities on-site at River Sky New Westminster includes an innovative outdoor green space, and entertainment clubhouse lounge with kitchen for entertaining and a fitness gym. The main level will feature prime retail space that will include convenience shops, services and the RiverSky Shopping Mews. Just steps from the New Westminster SkyTrain station, it is also positioned perfectly to get you anywhere in the Metro area. Also remember that the city has been going to a major transformation when it comes to local infrastructure with a new civic centre, upgraded park and public spaces in addition the area surrounding the waterfront New Westminster SkyTrain Station which will feature a full shopping and entertainment experience. Some of the new tenants will include a Safeway, Shoppers Drug Mart, services like banks and grocers, restaurants and even a Landmark Cinemas boasting ten movie screens! On Columbia Street, just steps away from RiverSky New West condos is the new Anvil Centre which is a steel and marble hub for the city that has just opened. It includes a five hundred seat conference hall, city museum, new media gallery, performing arts theatre, multi purpose rooms, art studios and meeting rooms. And this is not even to mention the historic significance of New Westminster which is the oldest city in the Greater Vancouver and a former capital of BC. The combination of heritage/historic and new urban spaces makes this an exciting neighbourhood to call home. RiverSky New West condos will be within close walking distance to both Columbia Street as well as River Market in addition to 48 parks and 141 hectares of green space including the 9.5 acre Westminster Pier Park on the waterfront! The new Bosa RiverSky New Westminster condo tower is situated just opposite the river on the Esplanade Boardwalk. This beautiful location will be home to some of the most luxurious high-rise view residences in the city and registration is already underway for the 2 residential towers that will offer innovative outdoor spaces, spacious interiors, lobby level retail space, an entertainment clubhouse lounge as well as a private fitness room. The New Westminster RiverSky by Bosa condos will feature an amazing locale that is within close walking distance to the New West River Market, the SkyTrain that connects you throughout the Lower Mainland including Downtown Vancouver and Richmond/YVR in addition to the riverfront boardwalk just outside your door. The sunny and extra spacious floor plans at RiverSky New West condos include one, two and three bedroom layouts and they will feature the BosaSPACE design for innovative and truly functional and efficient floor plans for any lifestyle. The neighbourhood surrounding RiverSky New Westminster is now compared to Commercial Drive and Gastown and is fast becoming the destination and place of choice for new homebuyers. If you thought waterfront living was beyond your reach, it’s time for a fresh perspective. 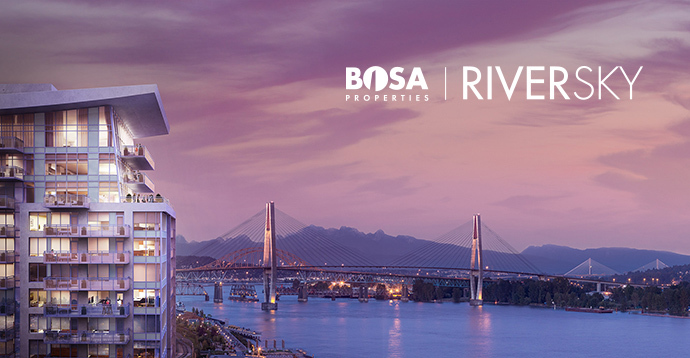 Introducing the Bosa RiverSky New Westminster condos for sale. 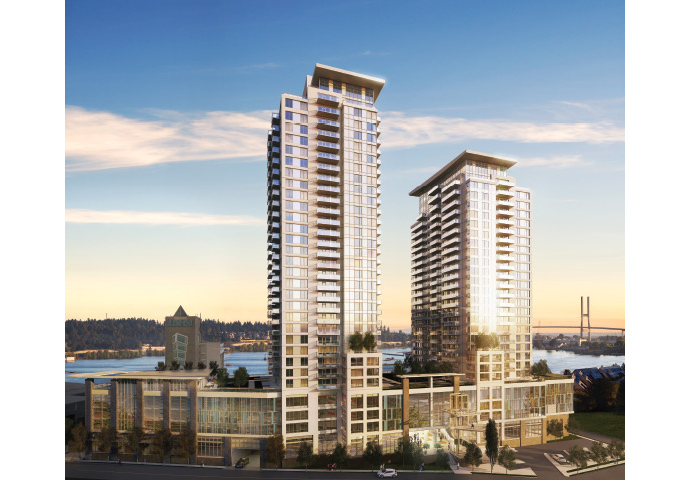 Offering one, two and three bedroom homes with river and/or city views, the New Westminster RiverSky Condos by Bosa are coming in early 2015. Situated on New Westminster real estate’s Esplanade boardwalk, next door to shops and restaurants of River Market and just steps away from the SkyTrain, RiverSky by Bosa gives you an affordable opportunity to own a waterfront condo at a reasonable price! From their marketing brochure: Interiors are modern, open, and filled with light—a continuation of the sky at your windows. Relax with coffee as the sun rises over the river; see the city light up the night. Life in the sky is stylish, with plenty of storage and generous counter space. The RiverSky New West condos feature tall pantries provide flex space and functionality. Integrated and stainless steel appliances and quartz countertops add beauty. Bedrooms feature custom millwork closets, and a shelf concealed behind the bathroom’s vanity mirror organizes personal products. PANORAMIC VIEWS: There’s nothing like living with a view of the water. Start each day with a perfect peaceful moment as you observe the morning sun on the river. Your dinner guests won’t want to take their gaze from the windows, whether it’s to watch the sun set or the twinkle of city lights. New Westminster RiverSky homes start at the sixth floor and rise into the sky, opening up to uninterrupted views of the Fraser River, watercraft, dramatic bridges, and snow-capped mountains. Although a dream for many – affordable New Westminster waterfront living is now a reality for you. 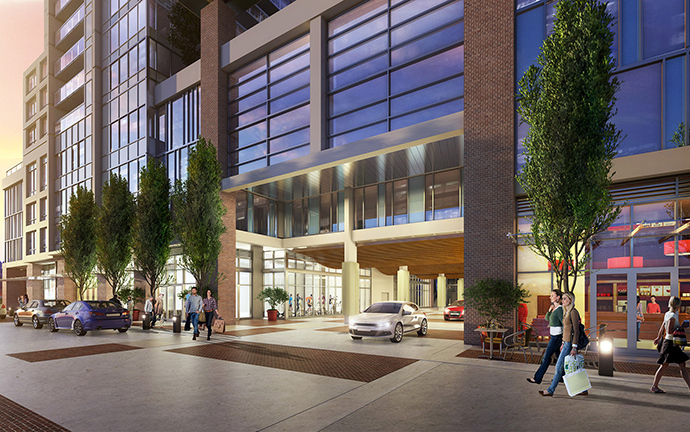 As a Bosa Properties Insider, we’re pleased to share news of our latest opportunity with you. A new riverfront community is evolving, next to the shops and restaurants of River Market New Westminster. Just steps from the SkyTrain station—less than half an hour from downtown Vancouver. Right on the Esplanade Boardwalk. An easy walk to the heritage architecture and food truck festivals of Columbia Street. Introducing RiverSky by Bosa Properties. This 33-storey tower at RiverSky New West condos showcase homes in the sky. Residences start on the 6th floor and up, opening to 360-degree views of the water, mountains, and surrounding city. New Westminster has been the focus of considerable media attention because of its urban renewal, SkyTrain access, and real estate that’s still affordable. The potential of New West is just starting to heat up. Walkable, livable, and central, it offers everything you’re looking for in a new home. Discover this next great waterfront community—complete with Bosa’s signature design and quality craftsmanship—here at the river’s edge. Riversky is developed by Bosa Properties (Quayside) Inc. Renderings, sketches, layouts and finishes are representational only. This is not an offering for sale. Prices subject to change without notice. E.&O.E. From their marketing brochure: New Westminster’s RiverSky condos rise high above the river, as bold as a tall ship sailing out to sea. Two sleek towers at RiverSky by Bosa are joined by landscaped outdoor patios at the sixth floor roof, and the fascinating lobby level faces the street like a ship’s prow. The building’s contemporary lines, elegant stature, and viewing decks turn heads when seen from either land or water. There’s something fascinating about waterfront neighbourhoods. They draw people from far and wide to animate their seawalls and boardwalks; sit in their sidewalk cafés, gazing at the play of light and water; and shop at their character boutiques. Metro Vancouver’s waterfront communities are legendary for their livability: Coal Harbour, Yaletown, False Creek … and now RiverSky New Westminster condos. Where the river meets the sky, and heritage architecture meets a hip food scene. Where you can buy a vintage fruit bowl and organic pears, then do a Zumba class while the kids are at circus school. Right on the Esplanade boardwalk, 3 blocks from Columbia Street’s shops and 25 minutes from downtown Vancouver are the new pre-construction New Westminster RiverSky by Bosa condo towers. THE BOARDWALK: Welcome to the gathering place for this animated riverfront community. Retail shops and an open breezeway create a community hub that connects Quayside Boulevard with 2.5 km of fascinating boardwalk for walking, running, filling your shopping bag, and relaxing over a drink. Meet up with friends before setting off on a stroll, checking out the farmers’ market, or deciding where to go for lunch.